Michael Rose in action for Morecambe against Burnley. 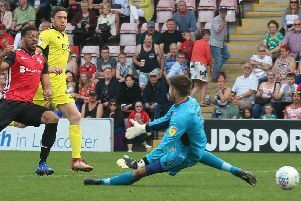 Morecambe have made Michael Rose their latest summer signing - the versalile former Rochdale man signing a one-year deal. The 34-year-old, who can play in defence or midfield, becomes the fourth Shrimps signing in the last six days after the arrivals of Alex Whitmore, Dan Nizic and Jack Dunn. Released by Rochdale at the end of the season. Rose has played more than 450 games for clubs including Stockport County, Norwich City, Yeovil Town, Swindon and Colchester. The former Manchester United trainee has been with The Shrimps throughout pre-season. Boss Jim Bentley said: “I have always admired Michael and he was someone I was keen to sign once I knew he had been released. “We have a young squad overall and his vast experience will be vital for us this season.